You’ve decided a Bengal Cat is the right breed for you. Trying to find the right breeder can be a daunting task. Hopefully this website will help. This directory is made up of Bengal breeders that have agreed to a voluntary code of ethics, which you can see here. – Does the breeder place kittens and cats with a purchase agreement (contract) and health guarantee? – Is the breeder willing to take the kitten/cat back if someone in your home develops allergies or there is another problem with keeping the cat? Or will they assist you in finding another home close to you, especially if the pet would have to be shipped back to the breeder? – What medical screenings does the breeder do routinely for their breeding cats? Some examples of specific ailments to ask about are Feline Leukemia (FeLV), hypertrophic cardiomyopathy (HCM, heart disease), parasite tritrichomonas foetus, and Pyruvate Kinase Deficiency (PK Deficiency). Some medical issues can be screened by a blood or DNA swab test, others, like HCM, require an echocardiogram. – Will the kitten or cat have all vaccinations and wormings appropriate for its age when you get it? – Does the breeder work with other breeds, and if so, how many and what breeds? – If many or most of their breeding cats are kept in outdoor enclosures (this is often the case especially with stud cats who spray! ), are the kittens raised in the home? This is a really good non-biased webpage at WebMD with information and tips on what to look for in a cat or kitten, and what you should expect from a breeder. If at all possible, visit multiple catteries to get a good idea of the different flavors of Bengals out there, and to see the cats’ environment, their temperaments, and how/where kittens are raised. Picking a Bengal kitten or cat based solely on convenience, or that it is located nearby can be a costly mistake in the long run. Reputable breeders sometimes will advertise on craigslist or similar online sources, especially if they are in a rather isolated area. However there are *many* backyard breeders trying to sell cats of questionable heritage and health, and even mixed-breed cats being advertised as Bengals on those sites. We can’t emphasize enough – do your homework, ask questions, don’t buy on impulse! Do you really want a kitten, or would an adult, maybe a retired breeding cat fit the bill? Adults are often available from breeders as young as a year or two. These cats have a personality that is already known and can fit wonderfully in your home, even if you have other cats (if proper introductions are made). Also, most Bengals get along fabulously with dogs! What pattern and color have you been dreaming of? 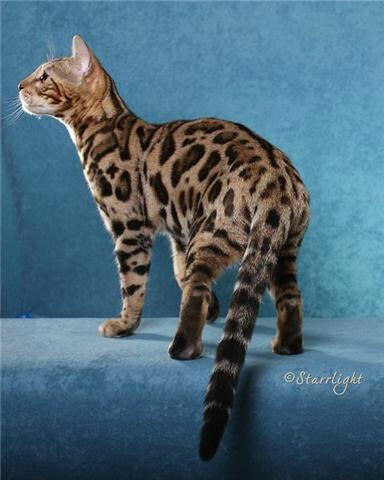 Bengals come in two patterns – spottted/rosetted, and marble (modified classic tabby pattern of swirls). 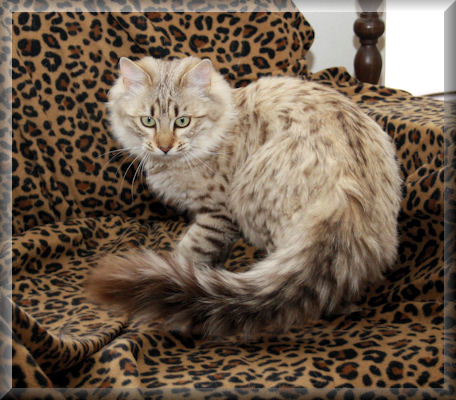 There are many different types of spotted patterns, and various types of “rosetting”. Colors accepted in the breed standard are any shade of brown (gold/wheat, to red/rufoused, to charcoal), the “snows” (seal lynx, seal mink, seal sepia), and silvers, as well as several combinations of those colors. Non-standard coat variations include blues and non-agouti (solid color with almost no visible pattern). Bengals also come in either shorthair or longhair. It is always best, if possible, to visit as many Bengals that you can in person before deciding. Many many buyers that are *sure* they only want a rosetted Bengal happen to see a marble at the breeder’s house and fall madly in love! The breeder may ask you if you are looking for a “pet quality” or “show quality” kitten. Show quality kittens are just that, the breeder feels that the kitten or cat would do well in the show ring, and fits the breed standard very well, not having any features that may be counted against in the show ring (ears too large or pointy or a spot of white hair on the neck, which is “color fault”). Those features on another kitten may make it “pet quality” and therefore more than likely less expensive. Either kitten should of course have a good, outgoing temperament. How much do Bengals cost? Breeders very often have available adult cats that have been retired from their breeding program (at a cost much lower than a kitten), sometimes only 1-2 years old, for a number of reasons. They sometimes will have or know of adult Bengals that have been rescued. If you really would like a Bengal but feel you cannot afford the cost of a kitten, or just prefer to give a rescue cat a home, feel free to contact a breeder in your area to inquire, or contact a local Bengal rescue directly. There are a few locations where Bengals are not legal to own, due primarily to misinformation and ignorance regarding the nature of the breed. In the USA, Denver, New York City, Alaska, and Iowa allow Bengals only if they are 3-4 generations or more from an ALC. Connecticut also has specific restrictions. If you live in one of these areas, you should follow up on the legal status of owning a Bengal.